Head of Percussion at the Royal Academy of Music Aarhus. New approach to all percussion instruments based on his Ki-Aikido inspired principles. My wish is to make music a larger part of society and help people to start being more creative and listening in their life. My old teacher in Freiburg Bernhard Wulff said that if we could make society work like a good chamber music group we would all be more happy. I want to create students and chamber music groups that can convey these messages by striving for the highest artistic standards. Please visit http://www.knarborg.com/#!free-teaching-videos-and-exercises/czkp to see some free e-learning videos and get an idea about my principles of teaching. 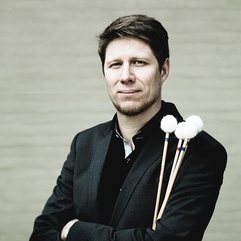 Danish percussion artist and educator Henrik Knarborg Larsen has performed as a soloist and chamber-musician all over Scandinavia, Europe, USA and Asia. He is Head of Percussion at the Royal Academy of Music Aarhus/Aalborg, where he has started a new approach to percussion education. He has based his teaching system on modern principles that encompass interpretation theory, practice strategy and new concept of body and mind awareness inspired by the Japanese martial art Ki-Aikido, which he presented first time at PASIC Indianapolis 2009. He has made masterclasses around the world, including Juilliard School of Music New York, Sibelius Academy Finland and Conservatorium van Amsterdam. In 2014 he acquired the position as percussionist at Århus Sinfonietta, the oldest and most prestigious contemporary music ensemble in Denmark, and he often performs with orchestras in Denmark and abroad. He has recorded several CD’s, including the solo-CD Convergence (Classico), and in 2015 he released a new media format video, and a artistic research article about Simon Steen-Andersen’s solo work written for him: Split Point. Henrik Knarborg Larsen is a true master of teaching percussion. He works deeply with every single detail of music technically as well as musically. The best part of his teaching is firstly that he can show exactly and understandably how to develop and play certain techniques on any percussion instrument and secondly how your body-balance and body in general should work and help you while playing percussion - that is deeply connected with Japanese Ki-Aikido techniques and principles what he has worked with for many years. He is a definitely the BEST teacher I have ever had. Henrik Knarborg Larsen introduced me to his special Ki-aikido concept of classical percussion and to contemporary music from Denmark, and along the way he opened my eyes to a world of music and artistry I have never experienced before. He has a natural ability to communicate his musical ideas effectively and clearly to a wide variety of students." Take live online video lessons with professional, passionate Percussion teachers from around the world. All you need is a computer equipped with a webcam and microphone. Learn more about how it works.